EUR is getting weak against the strong USD especially after the Fed Chairman speech, Janet Yellen, who supported USD. Since the previous high at 1.16155, EURUSD has been falling down the descendant channel in a choppy pattern. 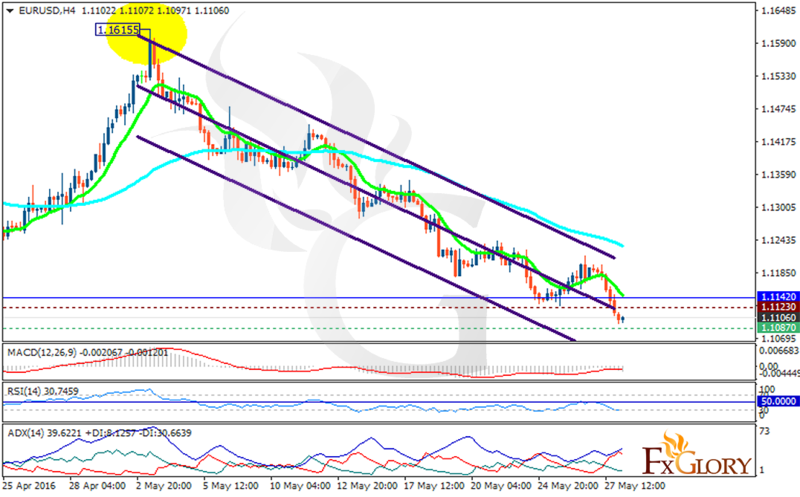 The support rests at 1.10870 with resistance at 1.11230 which both lines are below the weekly pivot point at 1.11420. The EMA of 10 is located below the EMA of 75 suggesting the current bearish momentum. All indicators are signaling sell opportunity; the MACD indicator is in negative territory, the RSI is below the neutral area and the ADX is showing strong sellers. The resistance level breakout will confirm this bottoming otherwise the price will continue its decline. Short positions are recommended with the target at 1.1070.